First impressions are undeniably important in the employment market. Research shows that a large percentage of employers decide a candidate’s fate within the first two minutes of an interview. 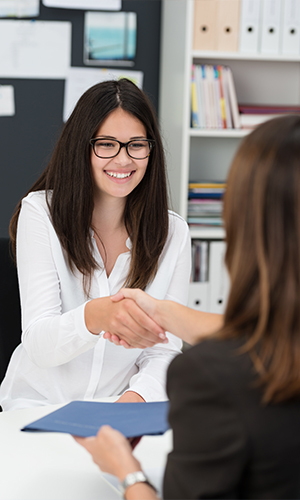 In order to give you the best chance possible at success, we have compiled a short guide to turn your next job interview into your next employment opportunity. Engage: An interview is essentially two or more people engaging in a conversation, in which one party wants to learn about the other, in order to determine if they are the right fit for the desired role. Therefore, your job as the candidate is to engage your potential employer and convince them why you are the right person for the job. This involves demonstrating your relevant skills and experience through clear communication and not being afraid to show a little personality. Manners: The easiest thing you can do in an interview is to show your manners. Be polite, courteous and always say thank you. Ensure you leave a good impression in the mind of your recruiter. You may not be suitable for this role, but if they like you, they may put you forward for something else. Practice: Nerves can often get in the way of good answers, so preparation is key. Brainstorm ten potential interview questions and practice answering them confidently and succinctly. Try to provide specific examples from past work experiences to support your answers. Look the part: Have you heard of the expression ‘dress for success?’ Well a professional, polished and well-presented appearance is your first step to conquering your job interview. If you’re unsure about what to wear, ask your consultant. They will be more than happy to advise you on the appropriate attire. On Time: Punctuality is important in the workplace, so ensure you arrive on time for your interview. Plan your trip a day ahead, make sure you know the location of your interview, how long it will take you to commute, and the name of the person to ask for on arrival. YES: Be a ‘YES’ person. By this we mean exerting a friendly, genuine and personable approach when speaking with your potential employer. Your interviewer wants to learn who you are, and why you are worth hiring. They want to see people who will go above and beyond in their role, who are passionate about what they do, and who are willing to say ‘yes’ to the challenge. For further information, or to speak with a consultant, please call 02 9235 3777.